It was nice to see the old Grade School in Alpine. It broke my heart when they demolished the School. I grew up living with my Aunt Miss Eula Jean Moore (Aunt Jean to every kid in Alpine). We lived on North 6th Street just across the School Parking Lot and next door to Johnnie Newel that owned Newel Oil Co. Justice of the Peace Hally Stillwell lived across the street. Me and my Brother and Sister would play at the Old School on the Fire Escape. There was a chain link bearer around it, but we knew how to get past it. I went to school at the New Grade School from 1st to 5th Grades. Mrs. Hill was my first grade teacher. I enjoyed her class it was fun. The bar ditch that separates the New School and the parking area has two bridges. These started out as two old doors and 2x4 put there by James & Randel Fitzgerald, Bobby Lane Hoffman, Mark, David & Emily Woodward and myself. We put them there in the summer of '67 or '68 so as to have a short cut. The next year just before school started they took out our bridiges and replaced them with concrete. As far as I know the new bridiges are still there. The 'very first' school buildng in Alpine was a two-story wooden structure that was used for a few years until the first permanent structure could be built. It was overcrowded from the start. The first true school house in Alpine was built in 1891 and this building is still located across the street north of the Methodist Church. This building later served as the offices for the U. S. Border Patrol, and most recently for the last dozen or two years houses as the Sunshine House. 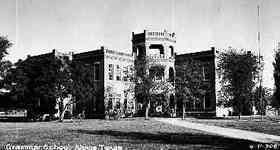 The picture shown was first called the High School and opened in 1910. It was completed to replace the small building first mentioned. In 1929 a new high school was built and this building then became Central School. I attended this school for my first years of schooling (1939 - 47), with Junior High (5th - 7th grade) being upstairs. Some time in the late 1960's to early 1970's the Central building was completely demolished and a new Grade School was built. Also, in the late 1970's a new High School was built north of town and just west of Kokernot Field. Alpine, Texas, please contact us.